The awards celebrate those who take a coordinated and holistic approach to reducing their environmental impact and resource demands of their operations and activities. Projects were recognized in the business, government, individual/groups, schools, and housing sectors, as well as two for Innovation. 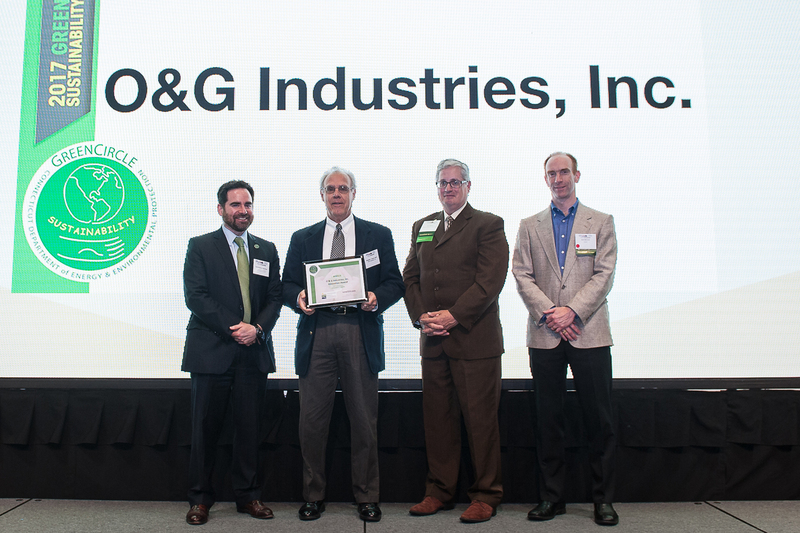 O&G received an Innovation Award during a ceremony on June 8 in Hartford. The company was awarded for its development of a bat hibernaculum on Boardman Road in New Milford. Ken Farnoi, O&G’s director of planning and permits, said the new habitat for bats is in an area where the company has a quarry. Rather than driving the animals out, O&G decided to find a way to help them. Ultimately, the old habitat — a cave measuring roughly 1,500 feet, will be eliminated, and the new hibernaculum will provide the animals with more space. O&G worked with DEEP wildlife biologist Jenny Dickson as part of their application to build the new habitat. “We received a very nice letter from her,” Faroni said. Faroni noted that brown bats, like the ones living in the quarry area, are less susceptible to the white-nose syndrome that has killed other species of bats found in Connecticut. The syndrome is passed on to the bats by a mite that lives on hemlock trees in the woods. Finding ways to expand the bats’ habitats could help their population. “The DEEP’s been monitoring the bat population from year to year, and the brown bats seen less susceptible to the syndrome,” Faroni said. Connecticut established the GreenCircle Award program in 1998 to recognize businesses, institutions, government agencies, individuals, and civic organizations who participated in energy conservation, transportation, pollution prevention or recycling related activities or projects that promoted natural resource conservation or environmental awareness. Since then, the good works of more than 1,100 award recipients have been recognized. In 2015, the program was revamped and renamed the CT DEEP GreenCircle Sustainability Award program to focus on the importance of sustainability and the importance of coordinated and holistic approaches to reducing environmental impacts and resource demands. At that time, a partnership for the awards program was also formed between DEEP and the Hartford Business Journal, to help bring more visibility to the program and build public awareness of it. The 2017 Green Circle Sustainability Awards were presented by Hartford Business Journal in association with the state Department of Energy & Environmental Protection. Presenting sponsors were Energize CT and Eversource; event sponsor was Solect. Story courtesy of the Register Citizen.